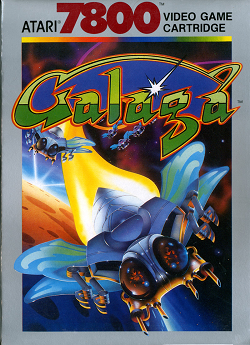 In this review, we fly through space in the Atari 7800 game Galaga. We find out how well this top down shooter plays. This game was released in 1987. This game plays a lot like Galaxian. You have 3 lives and you are pitted against progressive waves of aliens. Defeat the swarm of aliens and you progress to the next wave. This game improves on the formula in that you don’t actually have all of the aliens just appear from the start. Instead, lines of aliens will fly onto the screen in various paths. This gives you the chance to shoot them before they even make formation. If you miss them, with the exception of the last two, they will appear as part of the final formation along the top of the screen. Once the last alien makes formation (assuming there are survivors), they will attack you by flying down a couple at a time, often firing at you in the process. One thing to note is the fact that there is one kind of alien that requires two hits to destroy. They start as a dark green alien, but when you shoot them, they’ll turn a cyan (light blue) color. At that point, if you hit them again, they’ll die off like the other aliens. What makes things interesting in this game is that you get to try your hand at a challenge level every three waves. These challenge levels behave a lot like regular levels, but there is a twist. The twist is the fact that the aliens will all eventually fly off screen. It is up to you to destroy as many of them as possible before they get away. After the swarms, you’ll be assessed by how many hits you got. You’ll be given bonus points based on how many aliens you destroyed. After that, it is back to normal play. Another nice feature is the fact that you can gain a free life if you earn 30,000 points. I don’t know if that is the case at 60,000, but it certainly is the case at 30,000 points. One thing I found with this game is the fact that it can be repetitious. While the repetition can be useful in giving you an advantage, the repetition can also degrade gameplay. In this case, by the time I got to about wave 7 or 8, I find myself thinking that this game is getting too predictable. A little more variety in the swarms would have been great in improving gameplay. Another thing about this game is its simplicity. While this can make for great gameplay, it can also make for low quality gameplay. Given the release year, more complex games than this are hitting the market. This game was released in the same year as Mega Man. Other games like The Legend of Zelda and Super Mario Bros. are also on the market and sucking away all of the attention. While this game is an improvement over previous iterations, it is being surpassed by other games in terms of overall quality. Because of this, the game falls behind many other games by this time. The simplicity also plays into the fact that this game is short. In fact, you can easily have your fill of this game in under 2 hours easily. While that might be acceptable 5 years earlier, this kind of length isn’t going to cut it for fans of games from around this era. Generally speaking, this game is a nice improvement over previous games with similar titles. The features do help the quality of the experience. Unfortunately, this may be a case of too little, too late. Other, more complex and fulfilling games are already flooding the market. Because of this, expectations are rising on what people can expect in a video game. This game doesn’t really meet those expectations anymore. as a result, this game struggles to get much attention in the face of stiff competition. Graphically speaking, this game is also an improvement from previous home console games with similar names. Unfortunately, you are simply stuck with the same space background with pixels representing stars passing by. While the alien designs were nice, the bleak black background makes for a rather bland game. Varying backgrounds would have served this game well. Unfortunately, that is not the case. So, not a lot in the way of eye candy for the time. When you start the game, you are greeted with a short jingle. After that, there is nothing in the way of music. You get some very basic low quality sound effects. Suffice to say, there is next to nothing in this game that is all that great as far as sound is concerned. Overall, this game features some great improvements over the previous iterations of this game. The flying swarms and the bonus stages worked to make for a more interesting game. Unfortunately, this is a case of too little, too late. The NES is already on the scene for a couple of years and tearing things up. This game has to step up significantly just to help keep things relevant. Instead, it seems to be more or less stuck in the past where it was acceptable to have a game that lasts an hour or two. As a result, this game falls far behind others. The repetitious nature of the game helps things at first, but unfortunately, the game gets dull after a while because of it. The graphics, while improved, don’t do much for this game and the audio makes for a plain game. So, nothing hugely impressive here. Furthest point in game: 50,290. Died on wave 9.